← Has learning about fashion illustration been one of your resolutions? I know you’re like, “It’s not even Christmas yet! Why are you posting a Valentine’s Day pattern?” Because the February issue of Crochet Today magazine is out today and includes a “Favorite Blogger” feature of me, plus a link to THIS free pattern! Hello! Okay, I was first told that I would be in the issue of Crochet Today that dropped in December, but as it turns out, I’m in the February/March issue which dropped in January! Sorry for the mix-up! I have a feature in the magazine titled “My Crochet Life.” If you’ve come here from Crochet Today: hello, new readers!! 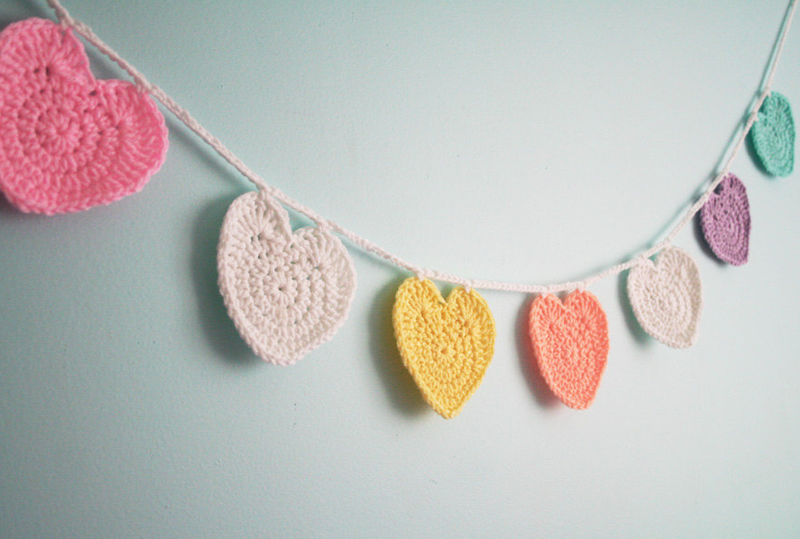 Here is your free crochet pattern for the Conversation Heart Garland! If you are familiar with working in the round, this pattern is pretty quick and easy, and you can make your garland as long or as short as you like, in whatever colors you like. Plus you can have lots of fun cutting out your own felt lettering for various messages! With I hook and whatever color heart you’d like to make first, make magic circle, or ch 3 and sl st to 1st ch to form loop. 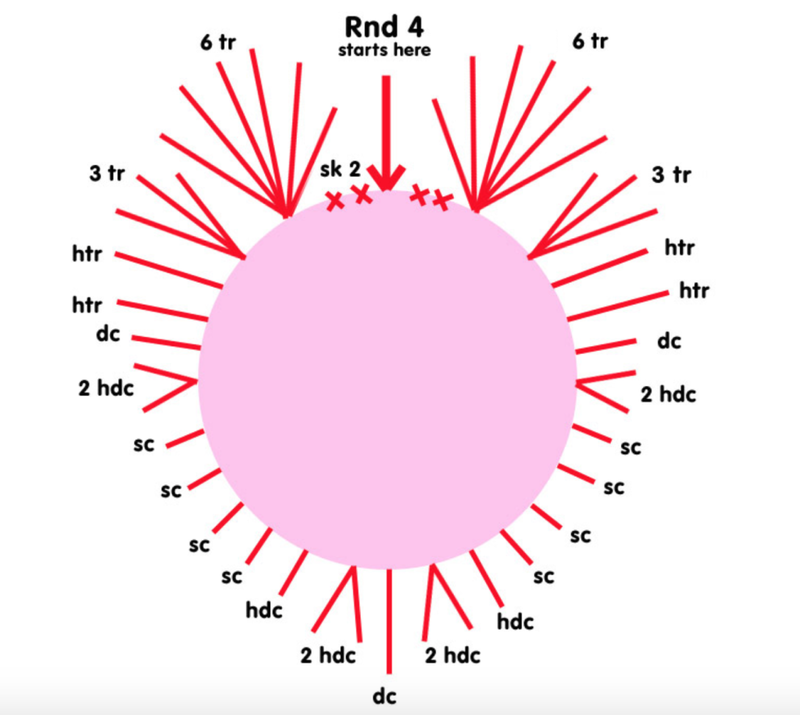 Rnd 4: (you may want to follow the chart below) sk 2, (6 tr), (3 tr), 2 htr evenly, dc, (2 hdc), 4 sc evenly, hdc, (2 hdc), dc, (2 hdc), hdc, 4 sc evenly,(2 hdc), dc, 2 htr evenly, (3 tr), (6 tr), sk 2, sl st. Break off and weave in all ends. 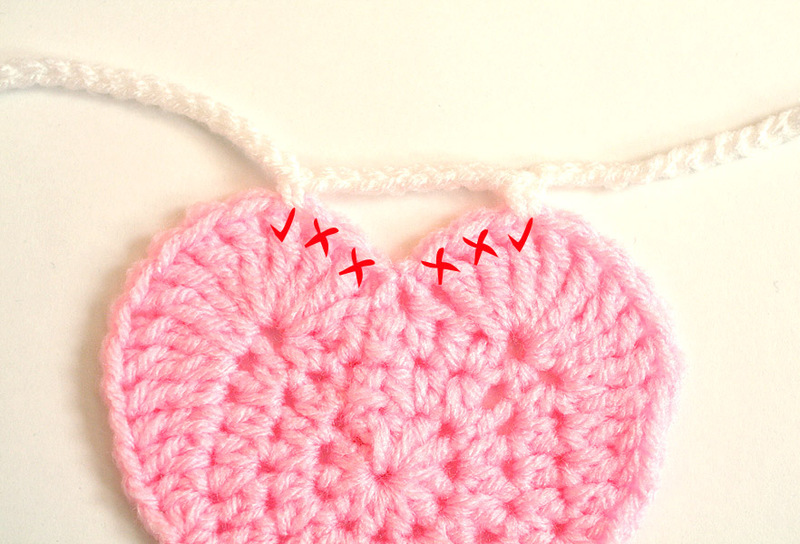 You should decide how many hearts you want to make and in which order they will hang, because you you will crochet them together in reverse order. 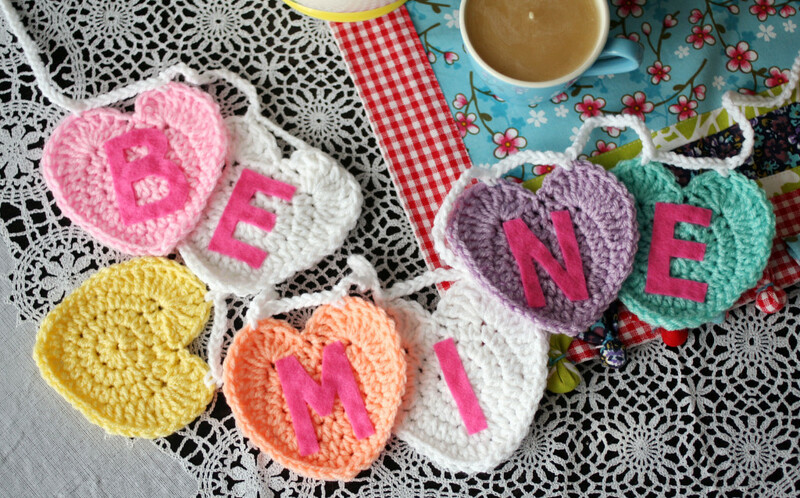 The “Be Mine” garland that I made went in this order: Pink, White, Yellow, Orange, White, Purple, Green. So you would actually start stringing the Green first, and then the purple, etc. 1. If you want to include lettering on your hearts, you can do that now, or at the very end. It’s up to you! 2. With White yarn and a G hook to create tight chains, ch 10 and sl st to 1st ch to form a loop. This will help you hang the garland more easily. 3. Continue to ch 30. 4. Take your Green heart (or the final heart in your sequence), with right side facing you, and work an sc into the top right of the heart. For me, this is the 3rd tr from the center (see photo below). Ch 8. Work another sc into the top left of the heart, which for me, is also the 3rd tr from the center. You may need to smush and pull and flatten everything out, but the chs across the top of the heart should run pretty much in a straight horizontal line, and it shouldn’t warp the heart in any way. If there is a sag, take away a ch or 2. If the heart is getting squished on top, add more chs. 5. Ch 15. Take your Purple heart (or your next heart in the sequence), and work sc in the top right corner of the heart, ch 8, sc in the top left corner of the heart. Repeat Step 4 with all of your hearts. 6. Ch 30. Ch 10 more and sl st to 10th ch from hook to form your hanging loop, and break off and weave in all ends. Thanks, Patricia! I try to keep my more basic patterns free, but I do sell patterns in my shop, too. I absolutely support artists/creators being paid for their time and talent! 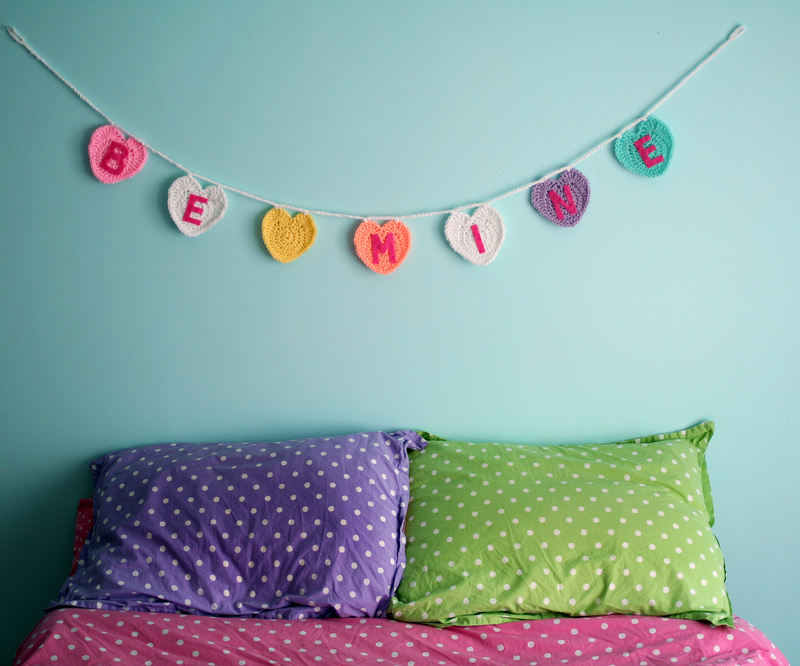 Sweet cute Conversation Heart Garland, thank you. I can hardly wait for Crochet Today to arrive in my mail. YAY! I own this 🙂 It’s hanging above my bed 😀 Love it! Some of the written instructions don’t match the diagram instructions on the last ending of the heart. Is one side of the heart suppose to be different? Cute pattern though. Thanks for pointing that out! I’ll take another look. I have so much going on all the time that I rarely have a chance to have a second pair of eyeballs on anything. Hi! Sorry for any confusion as to what the magazine included. I wasn’t asked to sell a pattern to the magazine, only to offer a Q&A. I don’t currently have the pattern prepped for either the xo cookies or the cupcakes, but I will try to get that together in the next 2 weeks or so. Watch my blog or my facebook page to stay updated! thank you! Pingback: Süße Dinge ~ Heute selbstgemacht | alyceen. 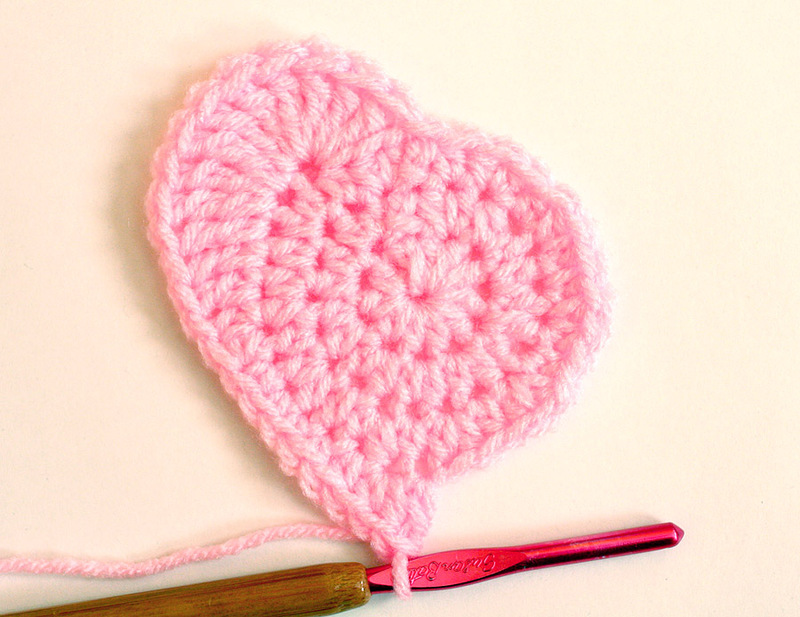 I have found numerous crochet heart patterns over the past few years. I have to say that your pattern is at the top of my list. I got it right on my first try! Your directions and your chart make completing this mission a success! Thank you so very much. You are Awesome! Paula! That’s the nicest comment ever!! I’m so happy you loved the pattern! What did you use for the letters? How did you make the letters stick? Love your pattern. Thank you! What type of adhesive did you use for the letters? Aw, I’m glad you like it! Great pattern. Thank you so much!! 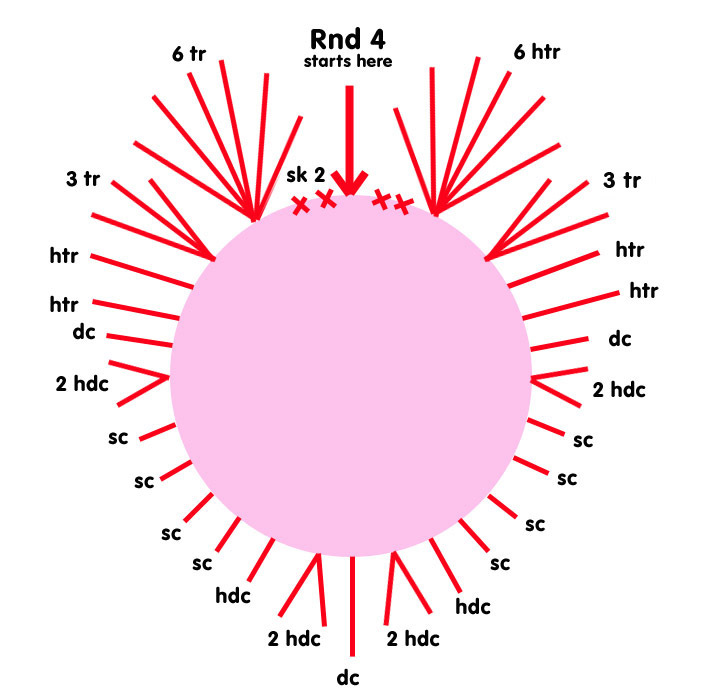 But there is an error on the diagram for round 4, coming up to the right side, at the top, it isn’t 6 htr, but 6tr. 🙂 I just wanted to point it out for anyone using the photo instead of the written pattern. Happy hooking! Thank you! What’s really weird is that I feel like someone pointed that out before and that I’d corrected it…. senility! Love this pattern. Used it to make kitchen scrubbies using the Red Heart Scrubby yarn. I added two more rows, (a contrasting color as a little extra pizzazz) first single crochet all around, then single crochet chain 1 in each stitch, to make it slightly larger. They are the perfect size. It’s become a go to pattern. Thank you so much, Trista! Congrats on your baby girl! Hi, nope! I just cut them free hand with felt. Thank you for another great pattern. I’ve made garlands for my grandchildren with their names for Valentine’s. 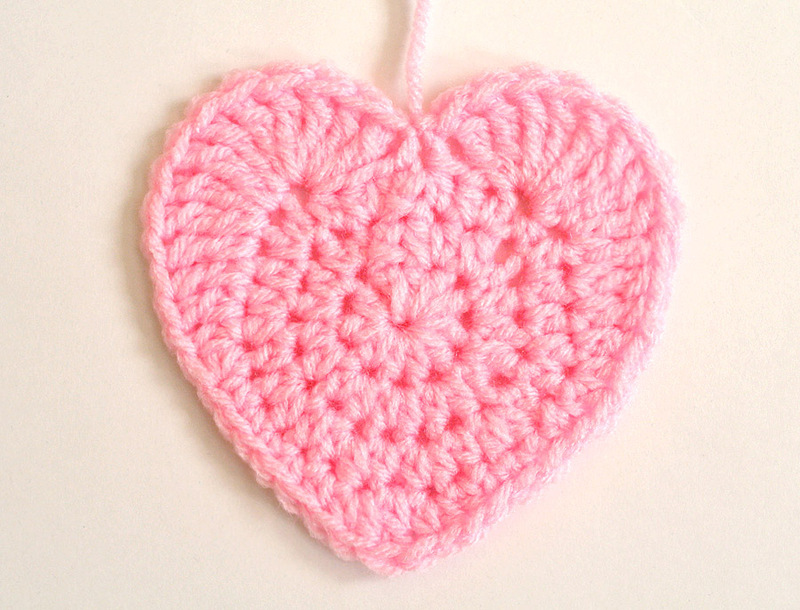 Just on a whim, I crocheted one of these hearts with no. 10 thread using a 1.75 hook. It’s so sweet. I added a crocheted chain to make a necklace. 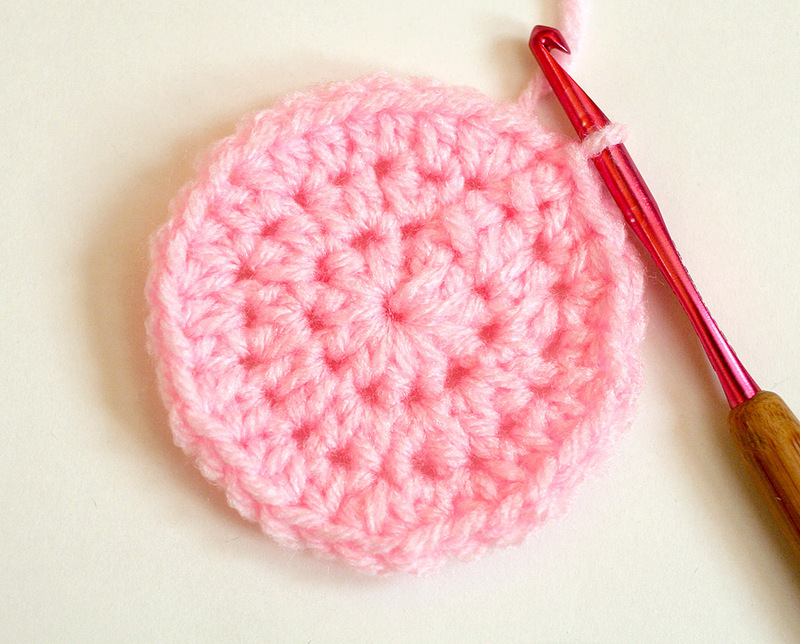 You make crochet so much fun!